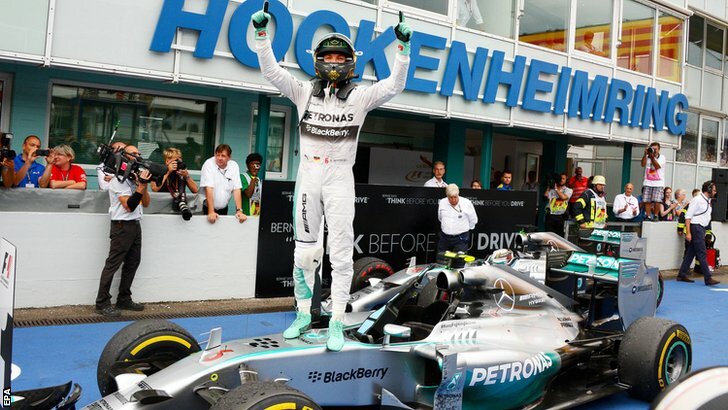 Home » Formula One: Rosberg romps to home win at Hockenheim! 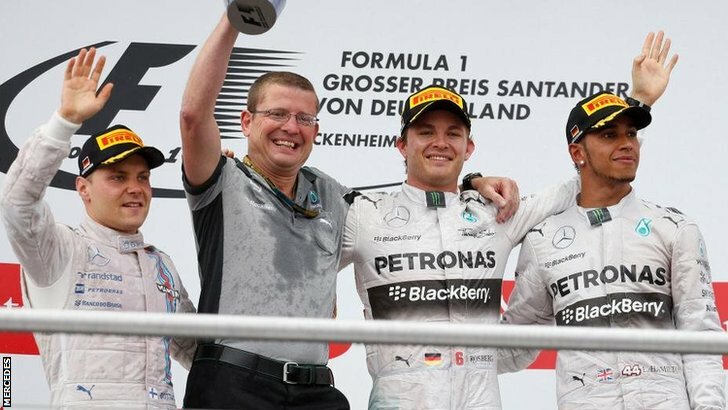 Nico Rosberg has taken the victory at the 2014 German Grand Prix, the first time that he has ever stood on the podium in his home race. The German led every single lap of the race from pole position to take the 7th win of his career and his 4th this season. Valtteri Bottas managed to hold on to a fantastic 2nd place ahead of the hard-charging Lewis Hamilton, who after crashing in qualifying yesterday also took a 5 place grid penalty which meant that he started in 20th. He had a bruising drive through the field to take the final spot on the podium. Nico Rosberg got a great start from P1 on the grid, but Bottas in 2nd got some slight wheel-spin in the second phase of his getaway. Team-mate Massa got alongside him on the left with McLaren’s Magnussen on the right. As they dived into turn 1, Massa backed out to sweep through to the apex but hadn’t seen Magnussen. The front end of the McLaren caught the rear of the Williams which pitched Massa into a roll into the run-off area. Massa got out of the car immediately, but the safety car was deployed. Hamilton had perhaps been hoping for a normal start so that he could pass more cars, but he’d still managed to gain 3 positions to move into 17th place. Upon the safety car restart, he made short work of Max Chilton into turn 2, followed by Maldonado at the turn 6 hairpin and then Gutierrez to move up to 14th by the end of lap 3. He then got by Grosjean into the hairpin on the next lap and then set about chasing down the Red Bull of Ricciardo who had dropped back after having to avoid the turn 1 crash. Ricciardo himself was trying to pass Adrian Sutil’s Sauber and managed to do so into the hairpin on the inside. Hamilton followed Ricciardo through, much to the surprise of Sutil who made slight contact with the Mercedes whilst trying to get the cut-back on the Red Bull. Daniel then set about overtaking former team-mate Jean-Eric Vergne at the hairpin, with Hamilton once again following him through. Hamilton then tried to get by the Red Bull on the next lap. He got up the inside at turn 6 once again, but then was met by the slow moving Ferrari of Raikkonen, which allowed Ricciardo to get by the Ferrari. The pit-stops began fairly early on lap 10 when Daniil Kvyat pitted following a spin at turn 8. The Russian had been trying to around the outside of Sergio Perez but squeezed him too much, leading to a trip off track for the Toro Rosso. 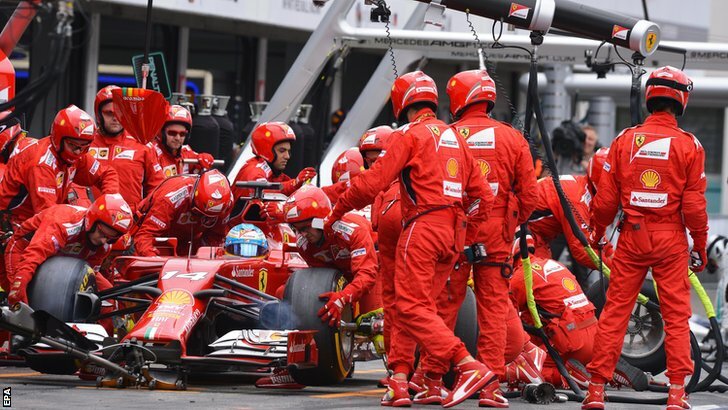 Fernando Alonso also pitted from 4th and dropped behind the battle between Ricciardo, Raikkonen and Hamilton. Hamilton tried to slip down the inside of Raikkonen into the hairpin. They went 3 wide with Ricciardo far on the outside. Lewis locked up as he tried desperately to get his car stopped. He managed to so but made some contact with Kimi’s car. Ricciardo was hung out to dry on the outside as Hamilton passed the pair of them for 7th place. Lewis then caught Perez on the next lap and used the DRS to pass him before they’d even reached the hairpin. Vettel and Hulkebnburg both pitted ahead of him which promoted the Briton into 3rd place. Vettel emerged with Alonso and Raikkonen, with all three going three wide into the hairpin. Vettel went to the outside, with Alonso on the inside and Raikkonen in the middle. Sebastian squeezed Kimi which led to the Finn banging into the pair. Unbelievably no incident followed as Vettel won the fight and took 4th ahead of Alonso and then Kimi. Rosberg then pitted from the lead which briefly gave Bottas P1 before he pitted at the end of the lap. Mercedes had a 1-2 as Bottas emerged behind Hamilton who hadn’t yet stopped. Bottas cruised up to the back of Lewis on lap 19, with the Briton letting him through as they were on differing strategies. It wasn’t until lap 27 that Lewis made his first pit-stop. He rejoined behind Ricciardo in 8th place but passed him on the exit of the hairpin on the next lap. Lewis then came across former team-mate Jenson Button into the hairpin on the next lap. Jenson went slightly deep into the corner, which Lewis thought was a signal for him to come through. Jenson then took the corner with Hamilton making contact with the side-pod of the McLaren driver. The Mercedes made a smoother effort of passing Jenson on the next lap and waved in apology as he did so. Hulkenberg was his next target in an easy move on the next lap for 5th place. Hulkenberg wasn’t having the easiest home Grand Prix in his Force India, he’d had to perform a complicated engine reset whilst travelling at over 180MPH on the back-straight and was now being passed left, right and centre as Vettel and Alonso cruised by. Hamilton made his 2nd stop on lap 44. The team elected not to change the front wing which had been damaged in his contact with Jenson Button. Instead they made adjustments to the opposite side to try and balance out the loss of aero. He re-joined in 5th. It was too early in the race for Lewis to go to the end on his current tyres, so he would have to stop again. 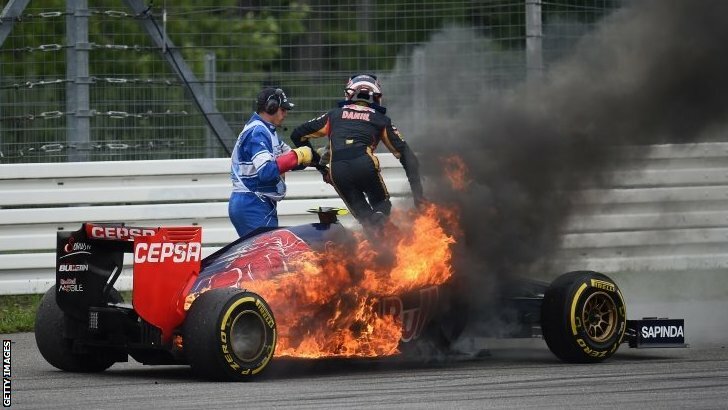 Two threats of a safety car deployment occurred within a few laps of each other starting on lap 47 when Daniil Kvyat’s Toro Rosso went up in flames at turn 6. The Russian pulled his car over quickly and jumped out of the car before showing his frustration by punching the track-side barriers. The car was extinguished quickly meaning that no caution was called. The drama wasn’t over yet as Adrian Sutil lost the rear of his Sauber out of the final turn. The car was just off of the racing line, leaving a narrow gap for the cars to pass through as Hamilton found out when he had to take to the run-off in avoidance. Sutil then tried to spin his car back around but then appeared to get stuck. The German had to step out of his car and retire in a very unfortunate home race. Hamilton took the opportunity to pit in anticipation of a safety car. The stricken Sauber remained in the middle of the final turn for almost 2 laps before brave marshals ran across the track to push the #99 car to safety. This meant that there was no safety car after all. Hamilton had pitted earlier than he ideally would’ve liked, meaning that his tyres would be degrading by the end of the race. He had Fernando Alonso separating himself from a podium and then had Bottas further up the road in 2nd place. Lewis immediately set to work and closed up on Fernando by 3 seconds a lap. It was an easy pass for 3rd for Lewis as Alonso was low on fuel. The Spaniard then pitted shortly after to emerge behind Ricciardo in 6th place. Lewis then set about chasing down the Williams of Valtteri Bottas in 2nd place. He was on the back of the Finn with just 6 laps to go, but appeared to have reached the limit by then. Lewis couldn’t pass him on the straights either due to the excellent straight line speed of the Martini Williams. Meanwhile up front, the untroubled Nico Rosberg was flying on his final lap. He set his best lap of the race as he took the chequered flag to win his home race; the first time that he had ever stood on the podium in Germany. It had been a dream week for Nico after getting married, watching his country win the Football World Cup, getting the pole and then grabbing the win at Hockenheim. Valtteri Bottas managed to hold on to take his 3rd consecutive podium, the first time a Williams driver had done so since Columbian Juan Pablo Montoya in 2003. Lewis Hamilton capped off a superb recovery drive to take 3rd place after starting way down in 20th. He’ll be hoping that he can have an undramatic qualifying next weekend in Hungary so that he can claim his 3rd win at that circuit. Sebastian Vettel managed to bring his FRIC-less Red Bull home in 4th place. He would go on to comment that it was the best they could have hoped for after being affected by the technical changes for this race. The battle for 5th and 6th was sensational in the closing stages of the race between Fernando Alonso and Daniel Ricciardo. Alonso had emerged behind the Australian after his final pit-stop but had much better tyres to try and pass the Red Bull with. Alonso got through at the hairpin but was immediately re-passed into turn 8 after Daniel sold him a dummy and took the inside line. Alonso re-tried the move a few laps later, Ricciardo tried to slipstream back past but was unable to do so. The race wasn’t over for him however, as Daniel had a great final two corners of the race and managed to close the gap to just a few thousandths of a second as the pair crossed the line. Nico Hulkenberg continued his incredible run of finishing in the points in every race of 2014 as he bought his Force India to 7th place in his home race. 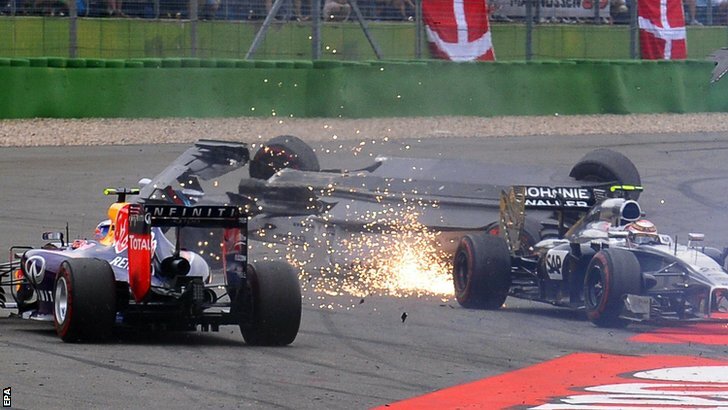 The two McLaren’s took 8th and 9th, with the pair brandishing battle scars following contact with Hamilton and Massa. Sergio Perez took the final point in the second Force India, with Kimi Raikkonen just missing out on the top 10. Newly re-signed Lotus driver Pastor Maldonado took 12th after having been in contention for points in the closing stages of the race. Team-mate Grosjean had an awful race after retiring due to mechanical issues once again. He joined Kvyat, Sutil and Massa as the race’s 4 retirements. Non finishers: Felipe Massa, Romain Grosjean, Daniil Kvyat, Adrian Sutil.